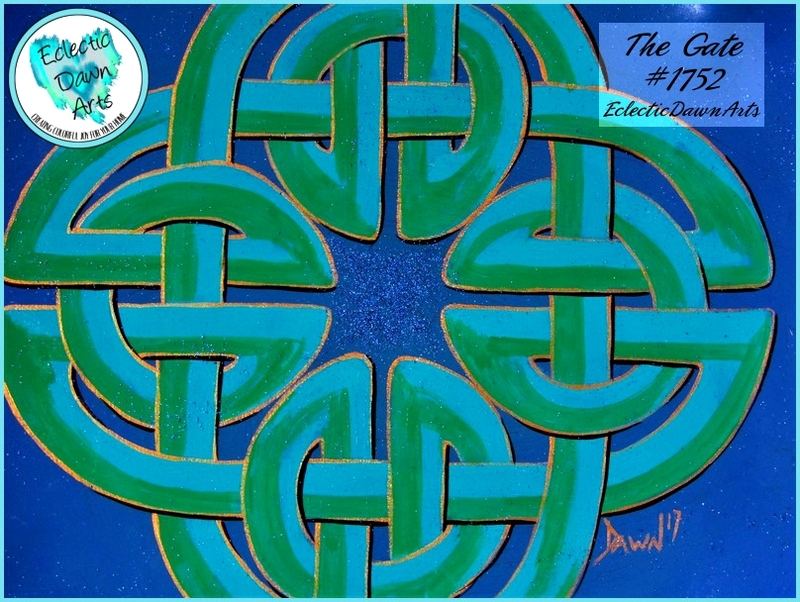 #1752 THE GATE, SIZE: ~12" square (sizes approx., accessories not included) LARGE. 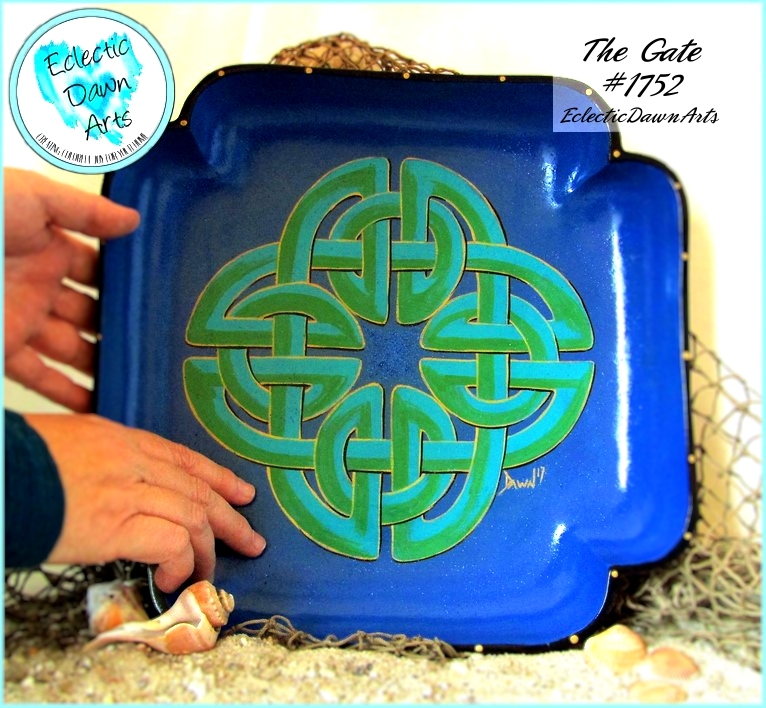 A Celtic knot in aqua and green sits on a deep blue background that is slightly textured to the touch with blue glitter speckles. Gold metallic and black accents outline the knot. A great altar or meditation piece! 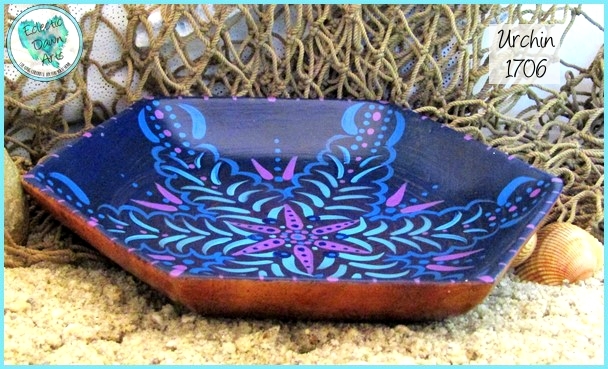 TB1731: 'Niagara' Trinket Tray or Decorative Bowl in aqua blue, purple, metallic silver, and black (accessories not included). ~5 inch square (sizes are approximate). 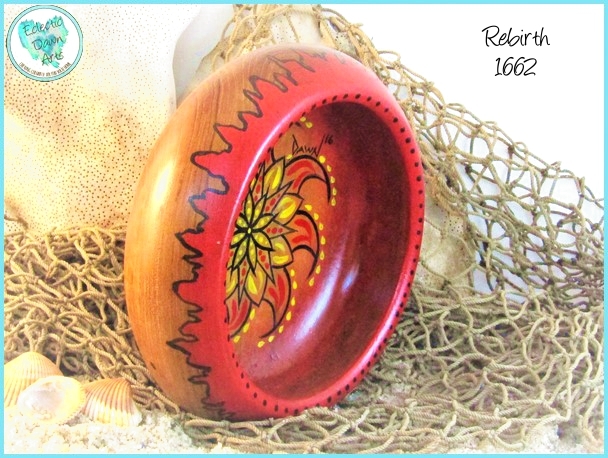 The rich color of the mandala design painted in this wood bowl will be sure to attract attention no matter where you place it. Not only a decor item, you can also use it as a place for jewelry or keys at the end of the day. 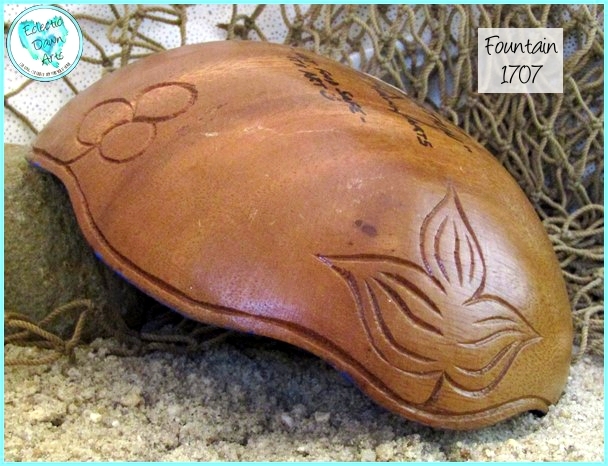 This is truly a "one of a kind" gift - IF you don't keep it for yourself! Free shipping. Not food safe, clean with damp cloth, do not put in dishwasher. 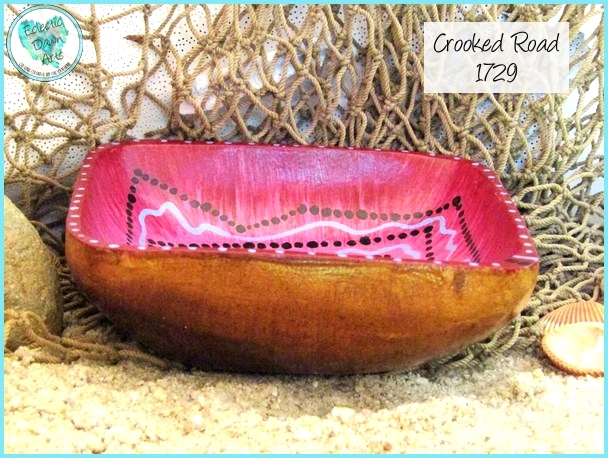 SOLD #TB1729: 'Crooked Road' decorative bowl, ring keeper, key bowl, done in burgundy, pink, lavender, and black dots and lines. ~5 inch square (sizes are approx). The path of life meanders. A thought-provoking piece to display on your coffee table or to use for your rings. Not food safe, clean with damp cloth, do not put in dishwasher. 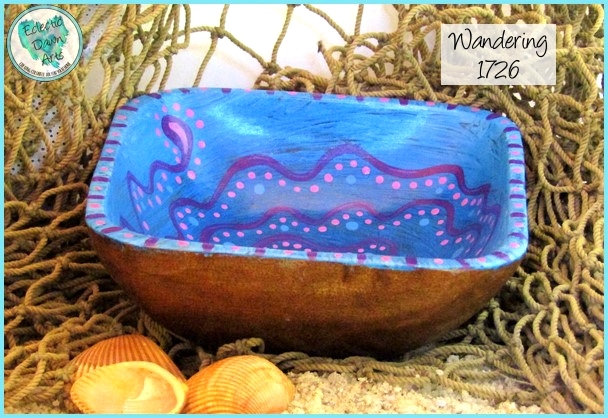 SOLD #TB1726 : 'Wandering' decorative finger labyrinth bowl in blues, purple, pink. ~4 inch (approx). 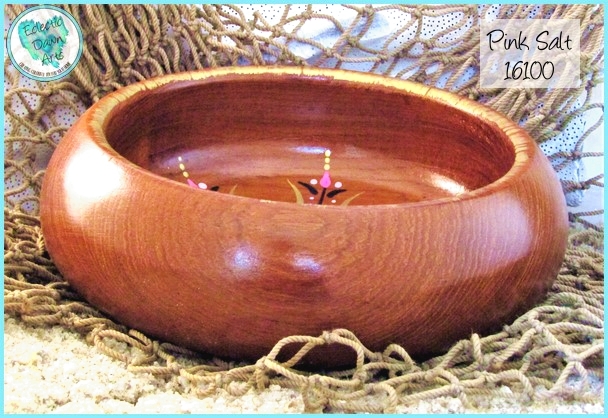 A path that starts and ends with a single teardrop meanders to and fro from center to outer edge of wooden bowl. 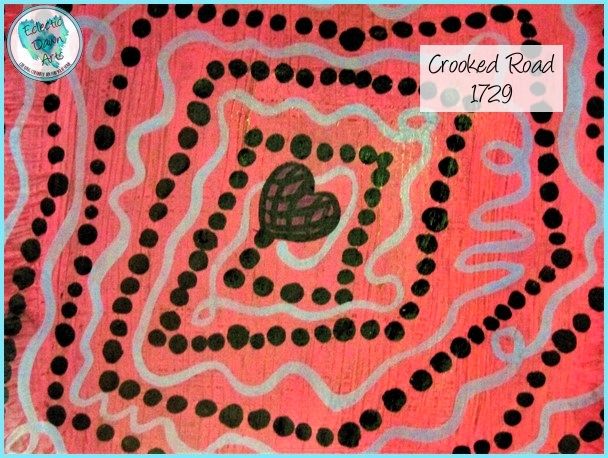 Use as a finger labyrinth and meditation aid, ring bowl, or a lovely splash of color. 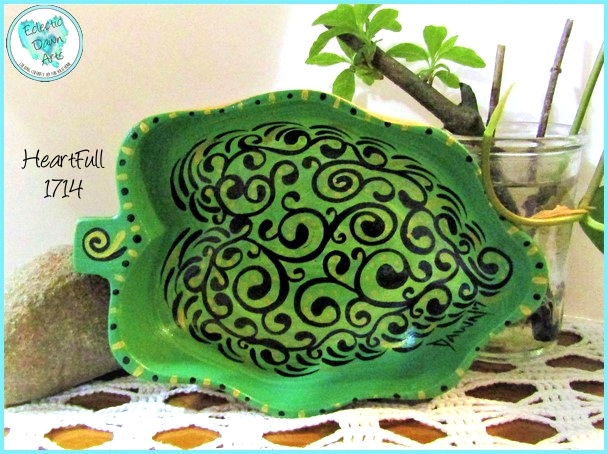 A one of a kind gift for those on an inner journey! Not food safe, clean with damp cloth, do not put in dishwasher. 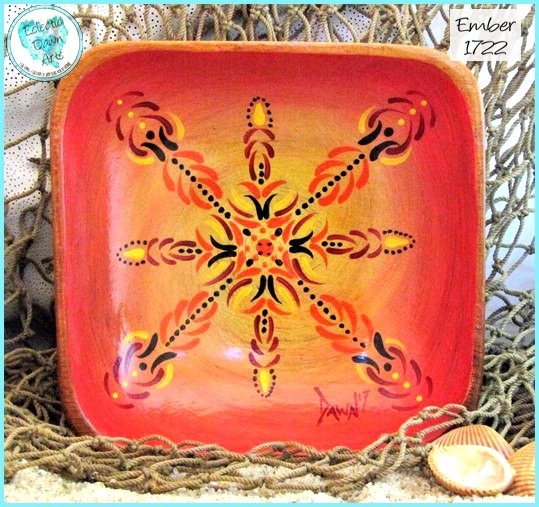 #TB1722 : 'Ember' square decorative bowl (accessories not included). ~5 inch square (sizes are approximate due to the organic shapes). 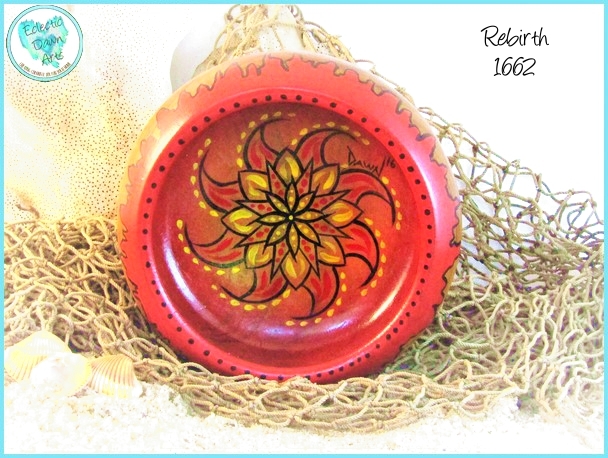 This fiery mandala design painted in henna style is a energetic accent piece for your home, but can also be used as a place to put your earrings or keys. 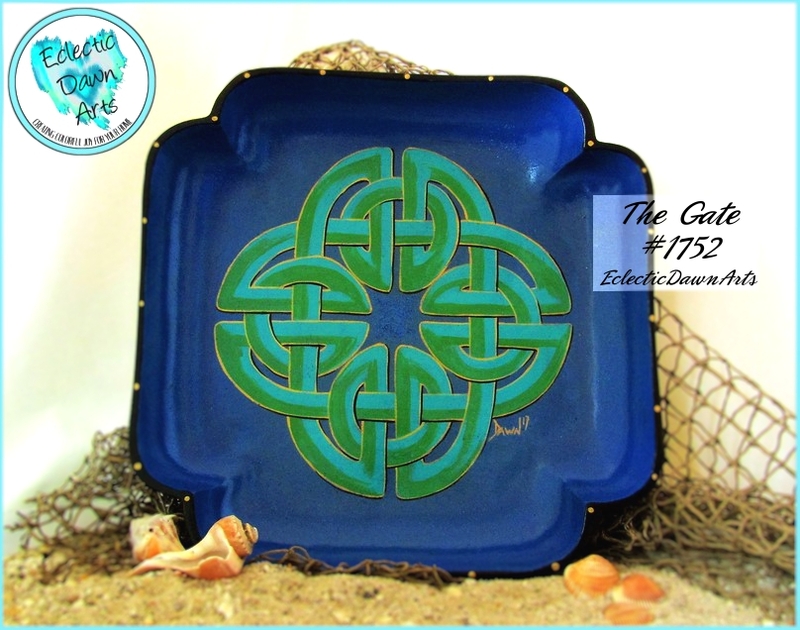 Our bowls and trays make unique gifts for any occasion! Free shipping. Not food safe, clean with damp cloth, do not put in dishwasher. 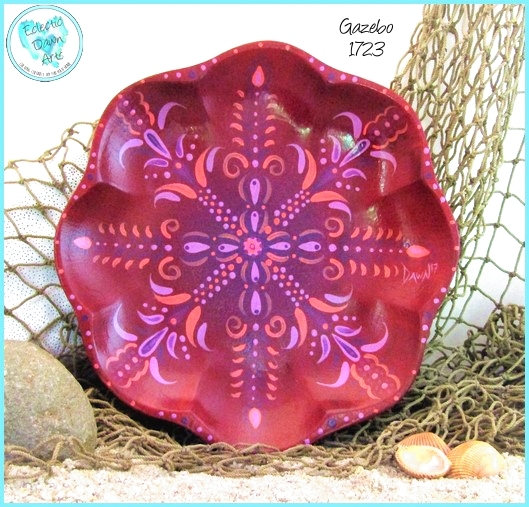 #TB1723 : 'Gazebo' Trinket Tray or Shallow Decorative Bowl (accessories not included), ~7.75 inch across (sizes are approximate due to the organic shapes). 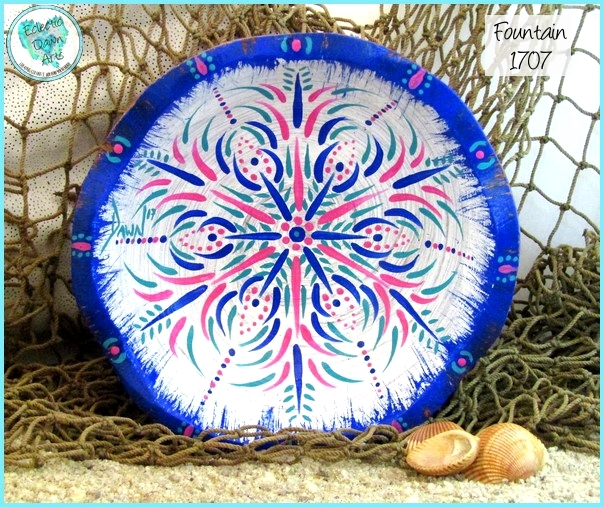 The ornate design and exotic color combination on this shallow bowl may bring to mind sitting under a gazebo with lush flowering vines climbing the supports. 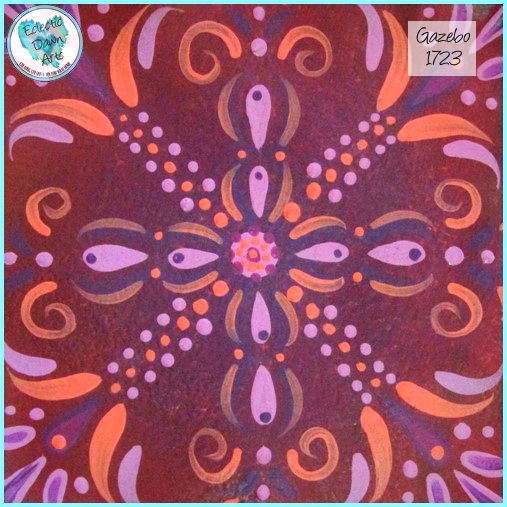 A mandala can be used as an aid in meditation, but you can also use this for a colorful home accent or a place to set your jewelry at the end of the day. 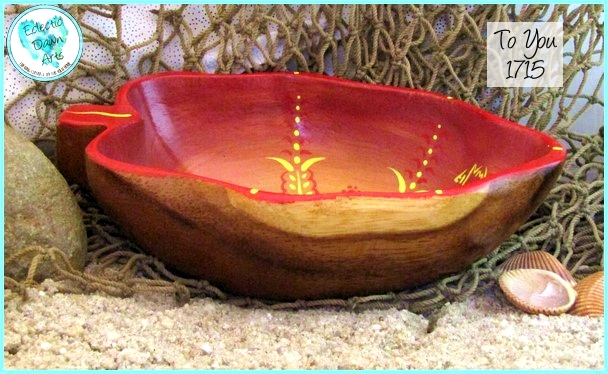 Our mandala bowls make a wonderful one-of-a-kind gift for a yoga student or teacher. Free shipping. Not food safe, clean with damp cloth, do not put in dishwasher. #TB1718 : 'STITCHED' Decorative Bowl (accessories not included), ~6.5 x 4.75 inch (sizes are approximate due to the organic shapes). 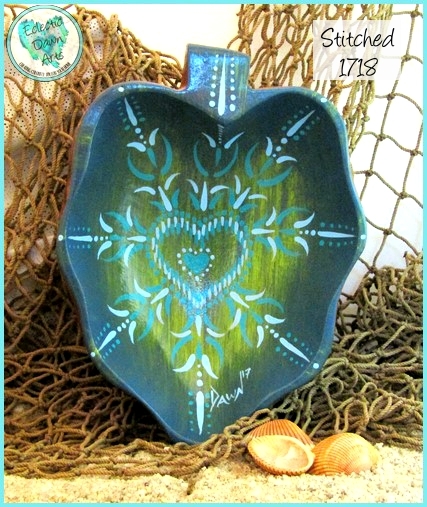 Beautiful blue/green tones create a henna heart design inside this reclaimed monkeypod wood bowl. Give someone a gift of the heart. Free shipping. Not food safe, clean with damp cloth, do not put in dishwasher. 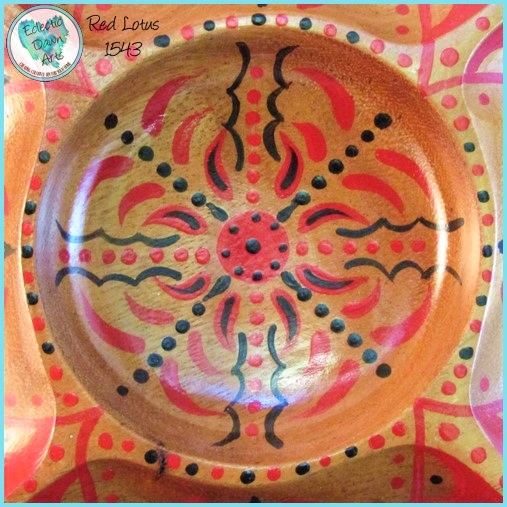 #TB1715 : 'To You' Trinket Tray or Decorative Bowl (accessories not included), ~10 x 10 inch (sizes are approximate due to the organic shapes). A message to you: your heart is beautiful! 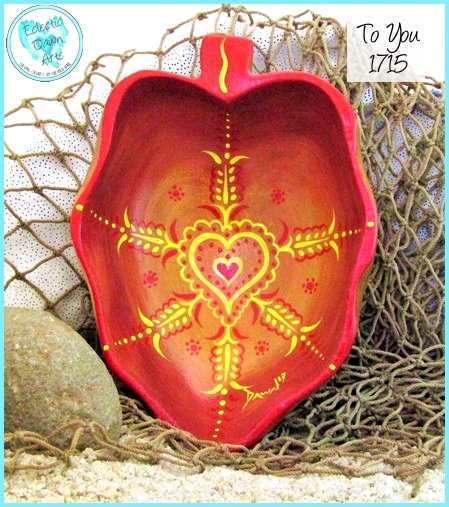 This yellow to red henna style heart bowl is the perfect gift of love to someone special, or set it somewhere to be seen as a reminder of the power of your heart. This would make a most unique wedding gift...from the heart! Free shipping. Not food safe, clean with damp cloth, do not put in dishwasher. 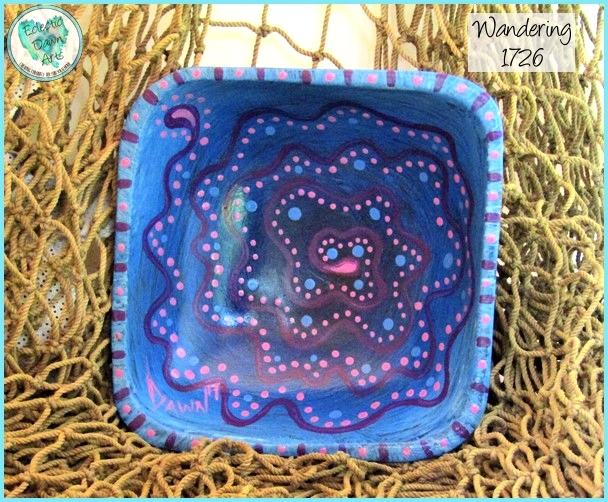 'Fountain' Decorative Bowl, TB1707 (accessories not included). ~6 inch diameter, round with carved exterior details. Did you love looking through a kaleidoscope when you were younger? 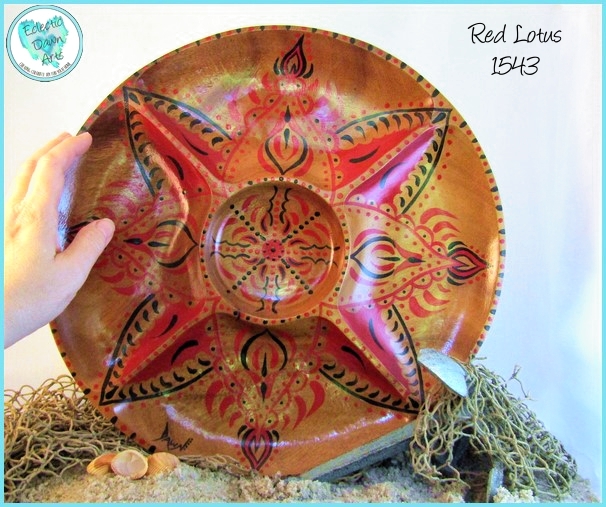 This bowl design is adapted from ancient henna art, yet has a modern look with its bright colors. A perfect place to stow your earrings, keys, or other tiny tidbits at the end of the day -- or, set it in a special place for all to admire. Colors: white, turquoise, blue, pink. This piece has four carved symbols on the outside. Free shipping. Not food safe, clean with damp cloth, do not put in dishwasher. 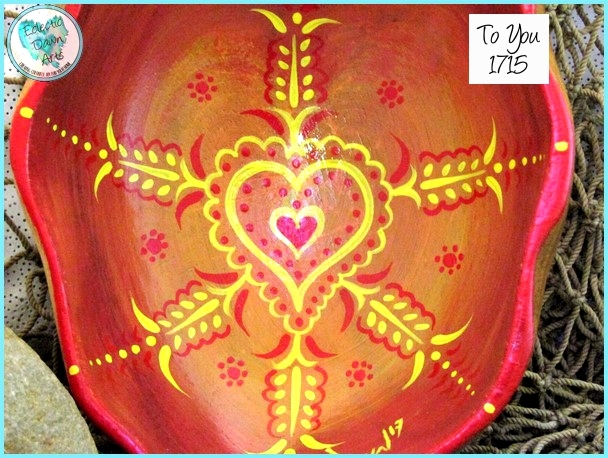 #TB1714 : 'HeartFull' Decorative Bowl (accessories not included), ~6.5 x 4.5 inch (sizes are approximate due to the organic shapes). When your heart is full, you can feel the growth! 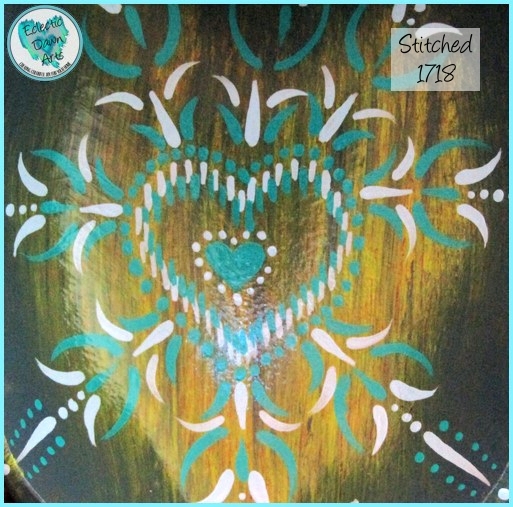 This green, black, and metallic gold hand painted piece is a precious love gift for someone special, a lovely wedding or engagement gift, or a pretty piece for your loving home. A wonderful gift for a gardener! Free shipping. Not food safe, clean with damp cloth, do not put in dishwasher. 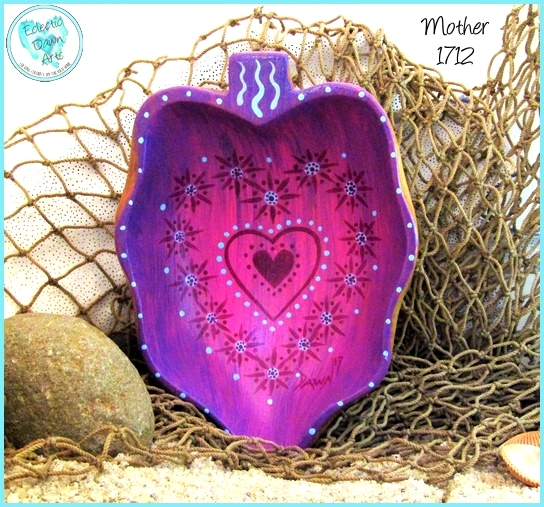 #TB1712 : 'MOTHER' Decorative Bowl (accessories not included). ~6.5 x 4.75 inch (sizes are approximate due to the organic shapes). 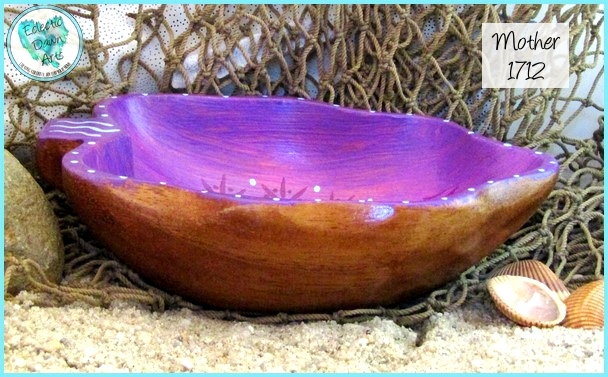 The pink, purple, and light blue heart design makes this bowl the perfect love gift for a special person in your life. 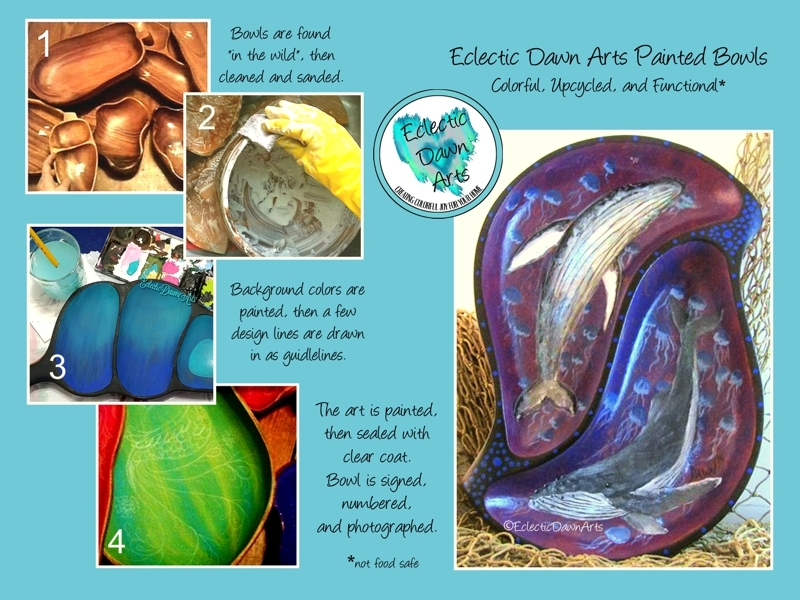 A thoughtful Mother's Day gift, special Valentine's Day gift, or a one-of-a-kind wedding gift to be used for jewelry, trinkets, rings, earrings, wrapped candy, or as an accent piece. Free shipping. Not food safe, clean with damp cloth, do not put in dishwasher. 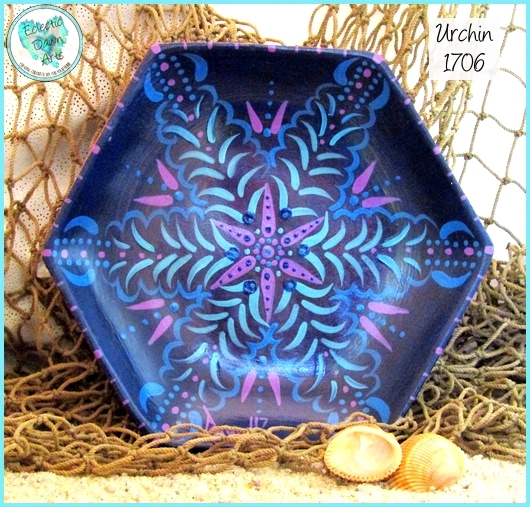 SOLD 'Urchin' Trinket Tray TB1706, ~6.75 inch across the widest points. 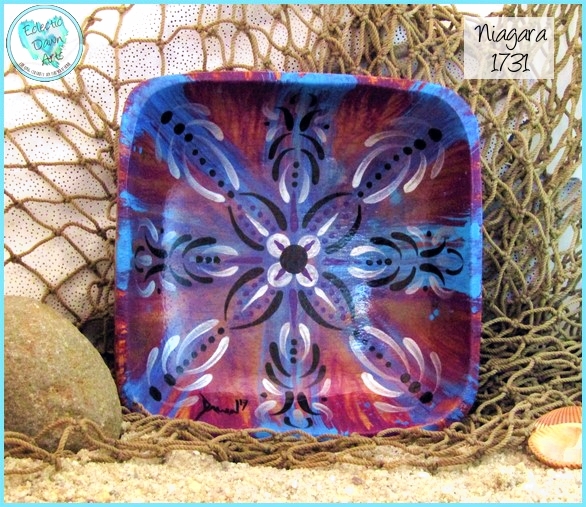 Blues (the background is a very dark blue, not black) and purples create a lacey henna-inspired design on this trinket tray, perfect on a nightstand for your earrings, rings, or hairpins. SOLD! 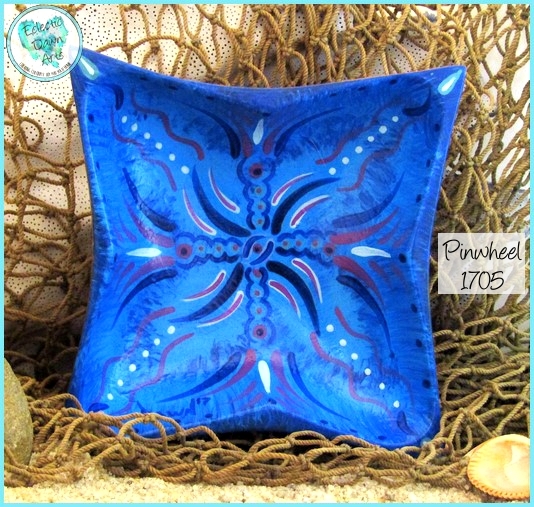 'Pinwheel' Decorative Bowl, TB1705 ~7 x 7 inch. Henna-inspired pinwheel design in blue and purple, colorful decor, or a safe place for your earrings at the end of the day! 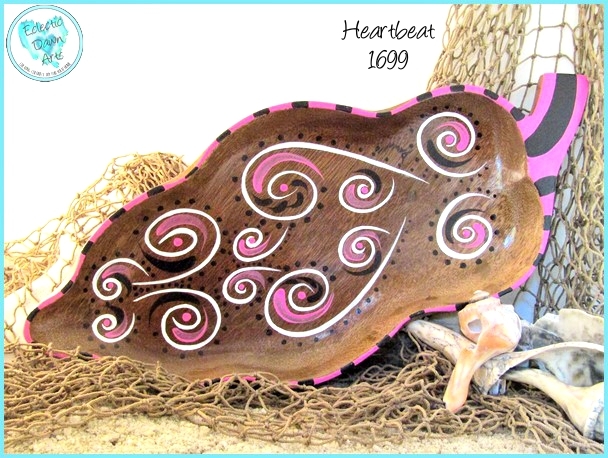 'Heartbeat' Trinket Tray or Decorative Bowl. TB1699. SIZE: ~15.5 x 6.5 inch (sizes are approximate due to the organic shapes). 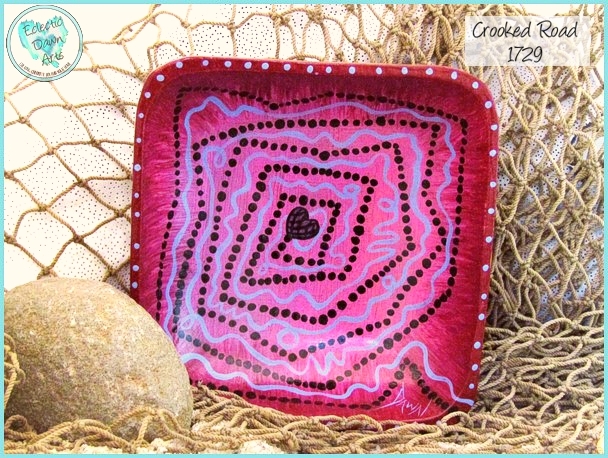 A pretty tray in pink, white, black swirls and swoops to keep your jewelry or keys in one easy-to-find spot...or to just be a pretty splash of color energy in a perfect spot on your coffee table or end table. Free shipping. Not food safe, clean with damp cloth, do not put in dishwasher. 'Rebirth', TB1662, ~6 inch diameter. The heart of a volcano stirs and swirls, beginning a rebirth with an eruption. Here you see the rebirth envisioned as a flower in the volcano. 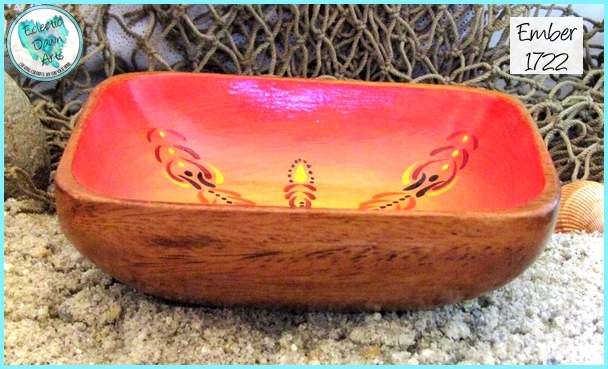 The edges of the bowl are painted with flowing lava. Can you hear Pele singing? This piece is FULL of energy in red, yellow, orange! Free shipping. Not food safe, clean with damp cloth, do not put in dishwasher. 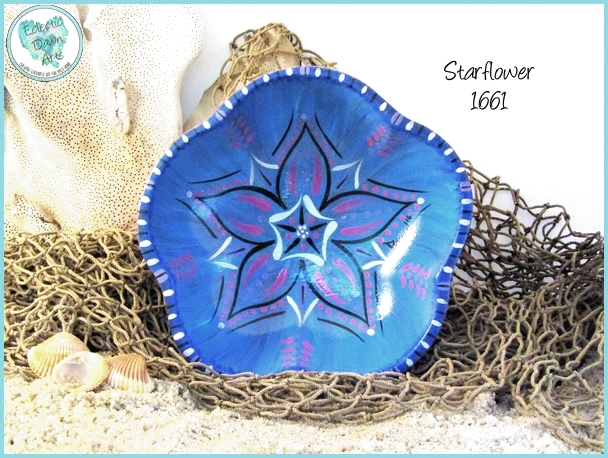 'Starflower', TB1661, ~6 inch diameter, flower shape. A flower falls to the water, floating on the breeze...you can just imagine the quiet ripples of the water when you see the delicate lines of this abstract piece. **Everything that looks "white" in the photo is actually metallic silver, which sets off the blue beautifully! Free shipping. Not food safe, clean with damp cloth, do not put in dishwasher. 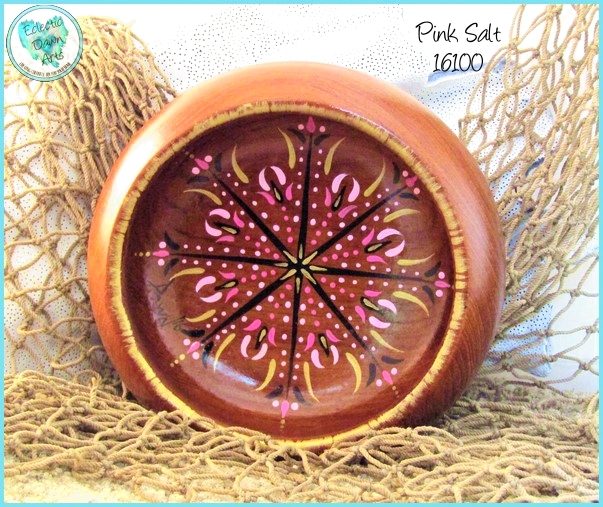 "Pink Salt" Trinket Tray or Decorative Bowl, #TB16100 - 5.75" diameter. Salt crystals remind me of snowflakes, and here is my imagining of pink salt crystals done in a henna style pattern in pinks, black, and metallic gold. Pretty "as is" wherever you put it, but the decorated bowl can also hold jewelry, keys, change, doodads, and thingamawhatsits. A unique gift, elegant decor that is also suited to the boho life. Free shipping. NOT FOOD SAFE, clean with damp cloth, do not put in dishwasher. 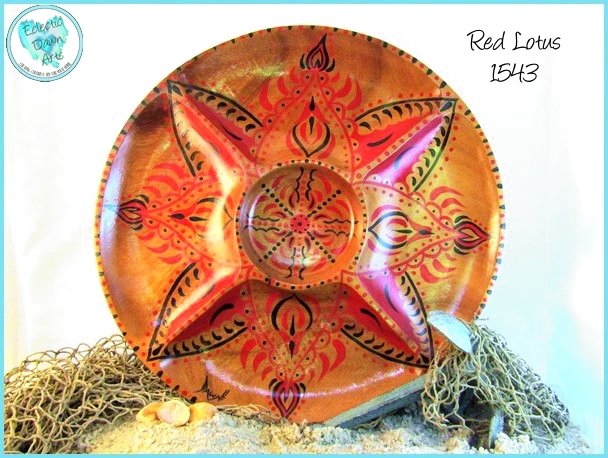 #1543 "Red Lotus" (accessories not included) - 14" diameter - This sectioned monkeypod tray is re-imagined as an intricate red and black flower. The design is similar to motifs from India, but the colors give it a distinctively Native American feel. 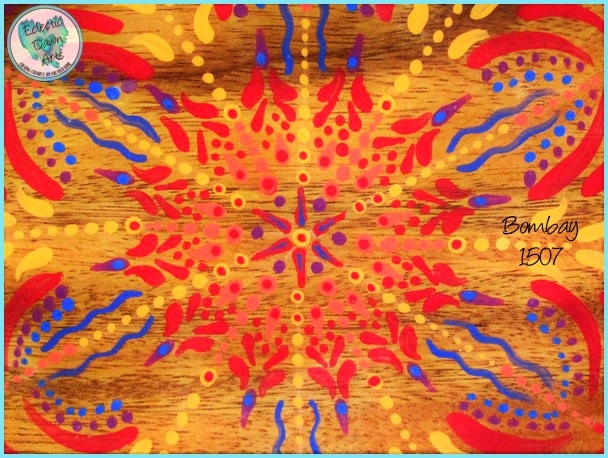 With it's strong energy, this large piece would be fantastic set in the middle of a large rustic table, or hung on a wall amidst Native American blankets. Free shipping. NOT FOOD SAFE, clean with damp cloth, do not put in dishwasher. 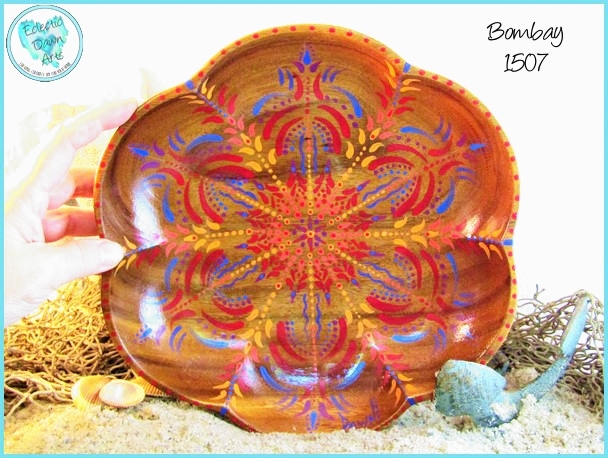 "Bombay" Bowl - TB1507 (accessories not included) Imagine delicate incense and soft silks surrounding you. This bowl, approximately 10 inches in diameter, is shaped like a lotus flower and painstakingly hand-painted with an intricate design inspired by the henna work of brides in India. Predominant colors are blue and red, with bits of soft orange and purple tucked into the design. Not food safe, clean with damp cloth, do not put in dishwasher. FREE SHIPPING.